MindTree Aptitude Papers difficulty has been of moderate level. There are a few important must do topics for MindTree Quantitative Aptitude Questions with Solutions that you must solve from our practise questions given below. MindTree Aptitude Questions Answers PDF, Aptitude Questions for MindTree, MindTree Aptitude Questions with Answers. Note – These are only Practise Questions for MindTree, you must solve all of them. PrepInsta student’s percentile has been known to be 40% higher than others. For other sections for MindTree like Verbal, Logical, Coding etc visit our MindTree Dashboard here. Here you will find all the previous year papers sections wise Analysis and Syllabus break up with chapters. Ques. What is the difficulty level of MindTree Aptitude Papers and how should I prepare for it? Ans. The difficulty level of the test MindTree Aptitude Questions is moderate but time management is the most important thing since you’ve to solve about 15 questions in 15 minutes thus 1 questions per minute which may be difficult. Ques. 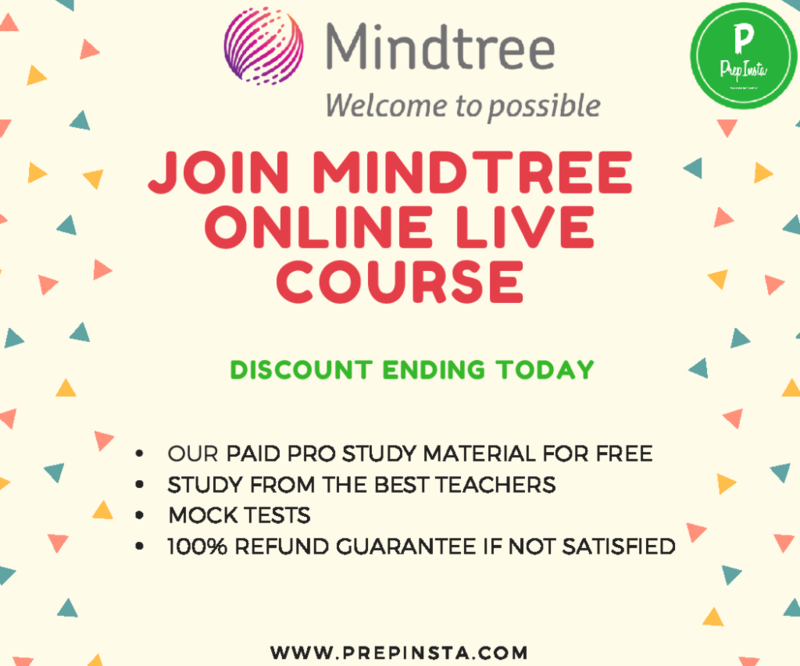 Is PrepInsta enough for MindTree Aptitude Questions Answers PDF preparation for the exam? Ans. Yes, for MindTree Aptitude Questions Answers PDF you can trust our website for detailed preparation. Ques. What is the Sectional cut off for Aptitude Questions for Mindtree? Ans In Aptitude Questions for Mindtree there are about 25 Questions thus if you solve around 19-21 Questions correctly you must be able to clear the sectional cut off for this round. Ques. For Mindtree Aptitude Questions with Answers should I refer any books?